Download your personal certificate with all your swims for print-out. 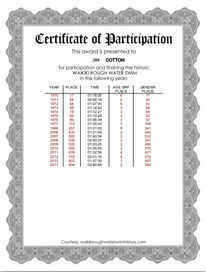 A nice gift or souvenir for one-time finishers and frequent swimmers! OUR TOP SERVICE: Find here the all-year-database with all historic finishers swim results! Please consider: Based on the Official Finisher List, our data base contains about 3300 data corrections and fixes in order to provide good statistical swim data. If you find any error, miss a swim or can report a name change, please contact us.